To report our experience with delayed anastomotic urethroplasty for pelvic fracture urethral injury (PFUI) during the last 10 years and evaluate both surgical and patient-reported outcomes. Retrospective analysis of 115 patients undergoing delayed anastomotic urethroplasty for PFUI between 2008 and 2017 by a single surgeon (AH) was performed. Success was defined as a urethral lumen large enough for passage of a 17-Fr flexible cystoscope. 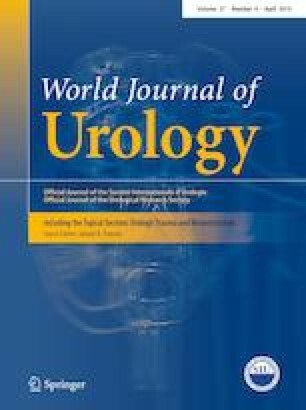 We asked patients to complete questionnaires before (baseline) and 1 year after urethroplasty and compared by paired t and Wilcoxon signed-rank tests the answers to a question about LUTS-specific QOL and the health-related QOL indicated by EQ-5D index and visual analogue scores (EQVAS). Overall patient satisfaction 1 year after urethroplasty was also evaluated. Urethroplasty was successful in 108 patients (93.9%), and failed urethroplasty was significantly associated with greater intraoperative blood loss (p = 0.009) and smaller surgical experience (p = 0.018). Sixty-six patients (57.4%) completed questionnaires 1 year after urethroplasty, and 65 of those 66 (98.5%) were “satisfied” (36.4%) or “very satisfied” (62.1%) with the outcome of their urethroplasty. The LUTS-specific QOL scores (p < 0.0001), EQ-5D index scores (p < 0.0001), and EQVAS scores (p < 0.0001) all improved significantly after urethroplasty. Delayed anastomotic urethroplasty has a high success rate and significant beneficial effects on both LUTS-specific and health-related QOL, resulting in high patient satisfaction. Careful manipulation in a bloodless operative field by experienced surgeons could be the key to successful urethroplasty. AH: data collection, project development, data analysis, and manuscript writing. MS: data collection/analysis. KO: data collection. AM: data collection. KI: data collection. TA: data collection. ET: data collection. FK: data collection. RA: data collection, project development, and manuscript editing.